The creativity, ingenuity and stamina involved in pulling off the world-famous "Triathlon of the Art World," the Kinetic Grand Championship, May 28 to 30 (free), is a thing to behold. The event started 47 years ago with a playful challenge from one artist to another and featured founder Hobart Brown's Pentacycle and a mere three blocks of madness. It has grown into the Memorial Day Weekend juggernaut of today, covering 42 miles of land, water, mud and sand, and sparking a handful of local, dedicated kinetic-related organizations. Someone you know is connected to the race somehow. Call it One Degree of Kinetic Nation. If you have family in town for the holiday weekend, make sure to work the spectacle into your plans. 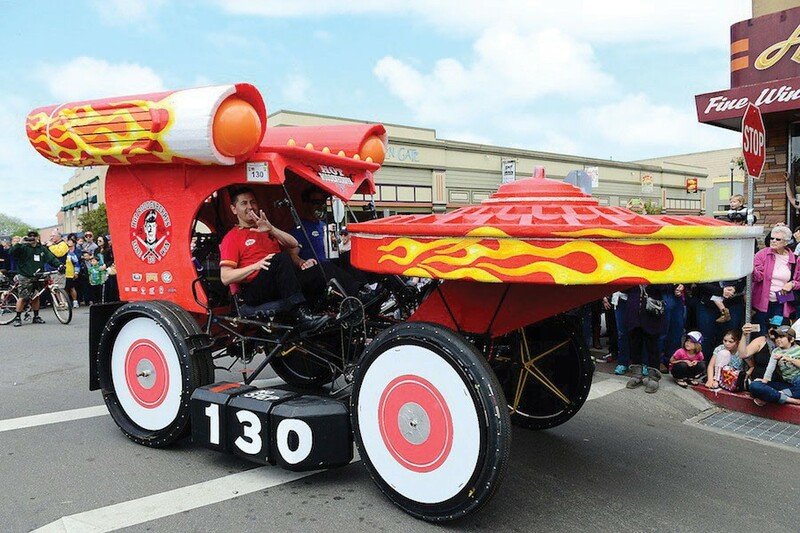 Start at the Arcata Plaza on Saturday between 10 a.m. and noon to watch the racers take a few laps around McKinley under the scrutiny of the newly crowned Rutabaga Queen Poisin Candie and a sizable crowd of enthusiasts. They'll then head off on Samoa Boulevard to Manila for the first leg, where at 1 p.m., you can watch them tumble, slide and flop down Deadman's Drop before making their way through Eureka, ending at Halvorsen Park. Sunday, they head south through Loleta and Fernbridge to the finish line on Main Street in Ferndale on Monday. Along the way, there are parties and organized shenanigans. For a complete schedule of the insanity, go to www.kineticgrandchampionship.com.